Caroline Grosso, Digital Fashion Director of W Magazine seems to have it all figured out. A scroll through her instagram and you’ll realize that her chic taste extends beyond just fashion. She’s a savant in all things up-and-coming and cool: from travel destinations, to hotels, to restaurants, and gallery openings– she’s always ahead of the curve. Grosso, based in New York City, has just moved back to the West Village after a decade of exploring other neighborhoods. 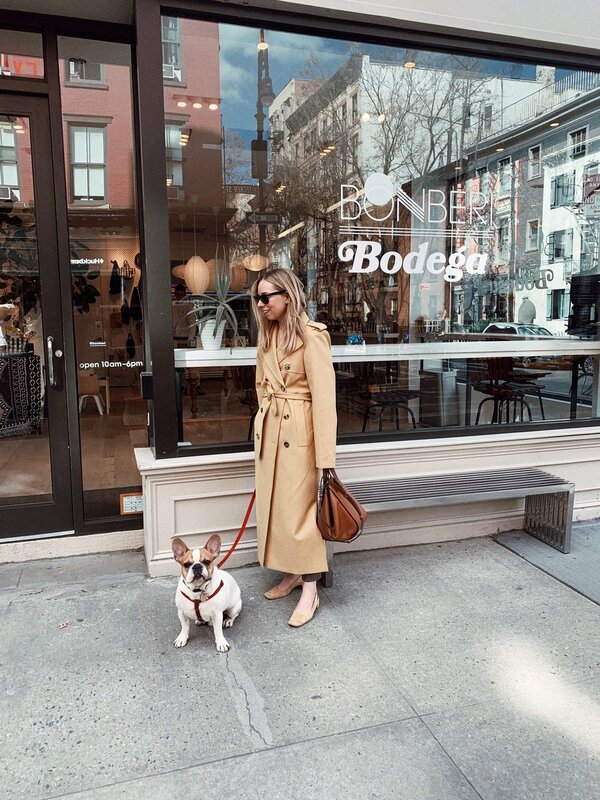 Below, she takes us on a tour as she rediscovers one of New York’s coolest neighborhoods with her adorable frenchie Louie. Best hotel in the neighborhood? To be quite honest, there are not very many hotels in the West Village to begin with! I’ve always wanted to stay at The Highline Hotel. I’ve attended a few fashion shows there, and the space is so dreamy. For me, it would be between that, The Standard, and The Marlton. In general my coffee habits revolve around my pup, a one-year-old Frenchie named Louie. It’s not that he’s a coffee snob, it’s just that some places won’t allow him in. For that reason alone we’re big fans of Rebel Coffee on Hudson, and Kobrick’s on 9th. If I’m dogless I love to go to Grounded - to me, that place is what the village should be. Super charming and convivial, worn-in-a-good way, you can hang with friends or on your own and the WiFi is still free and they have every kind of milk you could desire. Okay, I know everyone knows but still my answer has to be the Butcher’s Daughter, or Cafe Cluny. I moved about 6 months ago, so truly the only shopping I want to do is for my home. I love Calliope on West 12th - there’s always a new throw or ceramic bowl or table that I want to snap up in there. Rarely do I discover a home goods store that I find both inspirational and priced within reach. Hawkins New York, on 8th Ave, also has some nice finds. Best street for just about everything? Hudson Street. Perhaps not the most picturesque - but there are so many good restaurants and bars, you can grab a healthy juice or a broth, workout at purebarre or Soul Cycle, and of course it’s home to one of Louie’s favorite places, Zoomies. Best spot for the perfect Instagram photo? I mean I think the entirety of the West Village is practically made for Instagram. 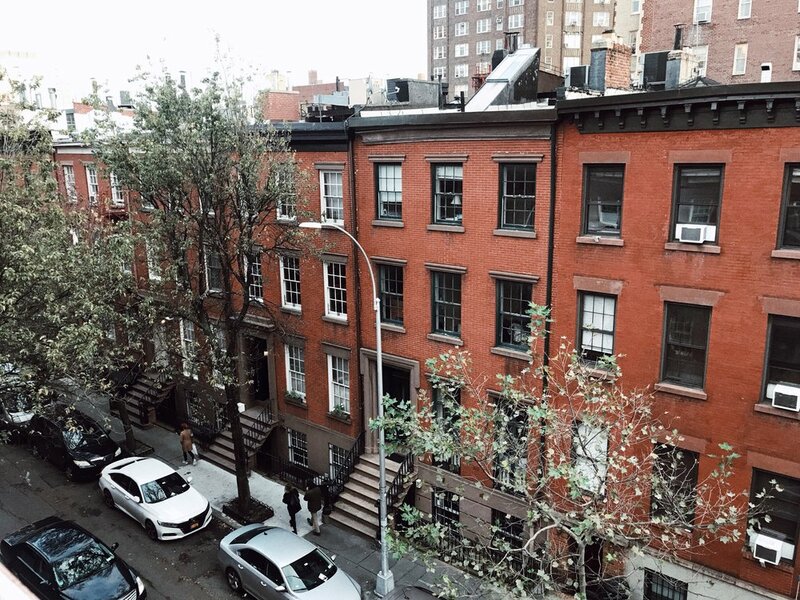 All of the tourists always throng the Friends house, at Grove and Bedford, but really if you walk along Grove towards Hudson, tucked away on the south side of the street is a charming Mews - I think that little nook is perfect for the ‘gram. If you were to ask Louie, his vote would be for the Marlton on 8th. The lobby is dog-friendly, they always bring him water, and there’s a cozy fireplace. Can’t beat St. Tropez for $1 oysters and wine. I don’t think they have happy hour specials, but sitting outside Via Carota in the summer at 5 pm with a glass of rose is pretty perfect, too. Best dinner spots for a big group? Technically I am stealing this one from another neighborhood I used to live in, Nolita. Balaboosta just opened on the corner of Hudson Street and West 12th. I used to go to their old location a ton with my girlfriends, and can’t wait to get a big table and share their Israeli-inspired small plates. (Can’t deal with a big group? Get takeout from their to-go joint Taim around the corner). One if by Land, Two if By Sea on Barrow. I love Bar Sardine, and Fairfax, which is across the street. Anfora, from the team behind the late dell’anima, is great for wine. For a more ‘pub’ vibe (my boyfriend is British) we love Highlands, or Tavern on Jane, a neighborhood staple where you will decidedly not run into anyone you know. The Whitney! When you have a major museum at your doorstep, it’s practically a sin not to make good use of it. We go later in the afternoon when the early birds are filing out. Insider tips only a local would know? Abingdon Square plays host to a farmer’s market every Saturday morning, with everything from fresh cut flowers to apple pies to cheese to vegetables. It’s small but mighty. It’s quite a festive square - in the fall they have a pumpkin patch and in the winter a Christmas Tree lighting party, complete with hot cocoa. Monica Mendal is a New York City-based writer, editor, and brand consultant focusing on fashion and travel. She contributes regularly to Vogue US, Vogue MX, Travel + Leisure, and L'Officiel US in addition to Condé Nast Traveler, Architectural Digest, Matches Fashion, SUITCASE, JW Marriott Magazine, and more. Previously, Monica was a fashion editor holding posts at Condé Nast Publications, such as Vogue, GQ and Glamour. Travel mantra: If it's hard to get there, it's probably worth going.